Toad Mountain is the name given to a hill near Gongguan with a military installation on top of it. You can easily see the red and white radar antenna on the peak from Roosevelt Road and Taida University. Toad Mountain is also the name given to the military dependents village at the base of the mountain on Roosevelt Road Lane 119. Before September 2013 I'd never heard of Toad Mountain. I had been to the more well known Treasure Hill across the other side of Roosevelt, which was also a former military dependents village. I was invited by the Renlai magazine and some residents to an arts festival taking place at the Toad Mountain Village, with the hope that I might draw the village. When the Chinese Nationalists retreated to Taiwan they brought their military personnel and their families. Some arrived with very little, and Taiwan did not have the living space available for such a huge influx of people. Many were housed in barracks and dormitories seized from the Japanese. There are a few Japanese era houses on the Toad Mountain site, and it's close to a military base. This suggests there was an army presence here before 1945. Around these seized buildings, or sometimes in new areas altogether, villages were hastily built to house military families. Around Taipei there were a great many; including Huaguang community and the site where Da'an Park is now. A lot of these have since been destroyed or are under pressure from developers. And pressure from developers is where the Toad Mountain Arts Festival sprang from. Graffiti on a house in Huaguang Community, another military dependents village. Toad Mountain was, like Huaguang earlier that year, under threat of destruction. The issue of land ownership and residency of these villages is complex. In many, while residents owned the buildings, the government owned the land, and people were forbidden from demolishing and rebuilding their homes. 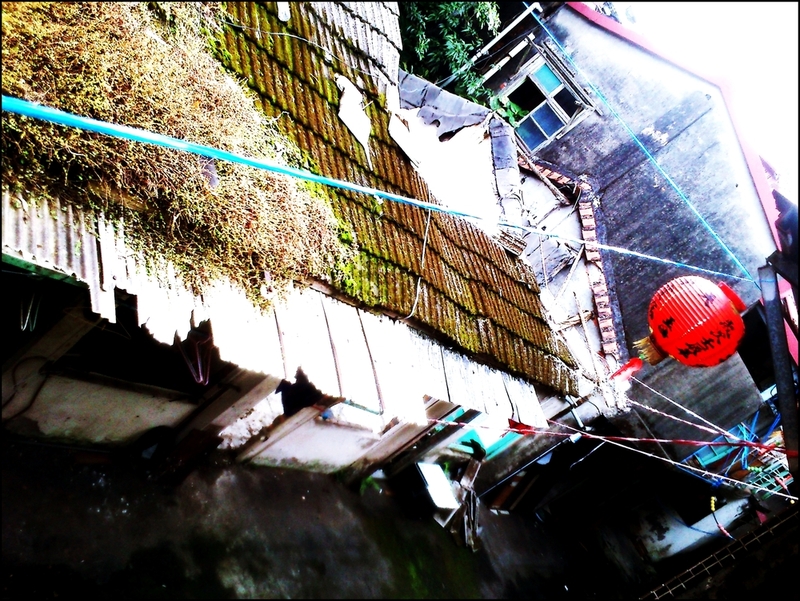 This led to villages retaining their old style appearance, but also for the buildings to become increasingly rundown. Successive governments have redeveloped many villages, as often they sit on prime real estate. The government often gave little consideration to the lives of the residents. Those in Huaguang faced lawsuits and intimidation and finally lost their homes with little or no compensation. In Toad Mountain the neighboring university bought up some of the village land and evicted the residents in the lower parts of the village. They intended to raze the village and build student dormitories. Villagers who refused were faced with litigation. A grassroots movement, fighting with the villagers to save the village formed. The Toad Mountain art festival was one such event designed to raise the profile of the village. I didn't really know what to expect at the village. But I don't know if it was the gorgeous weather that day, meeting a lot of interesting people, exploring the abandoned houses and narrow alleys, or just the peace and character of the place, but I instantly really liked it and began working out how to draw it. The village looks chaotic and clings to the base of the hill. Most of the homes are a little ramshackle and look well lived in. The older residents are mostly from China with distinct accents. It feels miles away from Taipei city yet it's just a ten minute walk from Gongguan station. One of the abandoned houses I spent a lot of time drawing Toad Mountain in. I didn't use the bathroom facilities. Over the next couple of months I spent a lot of time photographing, exploring, and drawing the village. Often in the day it was quiet, and I had the houses and lanes to myself. At 4:30 each day a group of villagers would practice square dancing to the same scratchy CD. I added them into the final map, along with some of the other villagers and dogs I met. The final map can be seen below. Little more than a few months ago the government designated Toad Mountain a cultural landscape. This saves it from demolition and keeps the villagers together. The lawsuits against certain residents failed as well. I was relieved as I'd also grown quite attached to it. It was nice being there a few weeks ago knowing that the village was victorious. I'm not sure exactly what the future holds for it. The Ministry of Defense has since secured many of the houses, but a fair few are still open. I personally hope to see it left mostly as is, perhaps with a small museum detailing life in the village, but without disturbance to the residents. I realize that most heritage in Taiwan doesn't stay that way, with many places turned into sterile shopping locations with no real connection to their past (e.g Huashan). So while I'm happy that the village is saved, I'm still waiting to see in what way. (Update Sept 2016 - I had a little wander around the village this month. It seems little changed. A development sign has gone up where the university hopes to convert a few of the lower houses to a kitchen, and clubhouse. There are still problems however, it seems the university want to let many of the other houses break down so they can demolish them. It also seems not all the court cases against the villagers have been settled yet. I hope things go well for the village! ).